Freezer alarms are a wise investment as they enable you to freeze food and even vaccines at safe temperature settings. The latter is especially likely if your kids are independent and like to reach for food on their own. Many of the alarms available today are pretty cheap, so you have no excuse for staying without one and risking the wastage of your food or even risking your family’s health. Here are the 4 most popular freezer alarms. This Taylor set is No.1 freezer alarm in America today. It has that classic dial display that we have long associated with freezer alarms. So it has a familiar look that won’t be intimidating. It’s cheap and costs just $6.36 so why pay more? It provides a wide temperature range and can register between -20 to 80 degrees Fahrenheit. It has an extra-large, 3-1/4-inch dial which you can accurately read at a glance. The “safe freezer” and “danger” zones are color-coded depending on your reference temperature, taking the guesswork out of whether you need to take remedial action. It’s constructed from stainless steel. This means it’s durable, corrosion-resistant and won’t be damaged by the freezer’s extreme temperatures. It comes ready to hang in any freezer or fridge, so there’s no need to buy suction cups separately and start fidgeting with these. 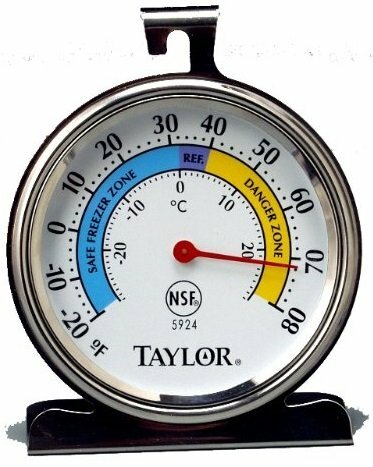 It’s made by the renowned Taylor Company, which has been producing precision instruments for over 150 years. So this is a tried and true product. If you prefer a digital freezer alarm to the above analog one, this AcuRite thermometer freezer alarm set is the bestselling one in this category. It provides the option of reading your temperature in either degrees Fahrenheit or Celsius. You can even alternate between the two. It covers a wide temperature range of -40 to 100 degrees Fahrenheit or -40 to 37 degrees Celsius. The thermometer display unit beeps and flashes when the temperature goes beyond your preset minimum or maximum range. This way, it audibly and visually alerts you to take remedial action to prevent food wastage. 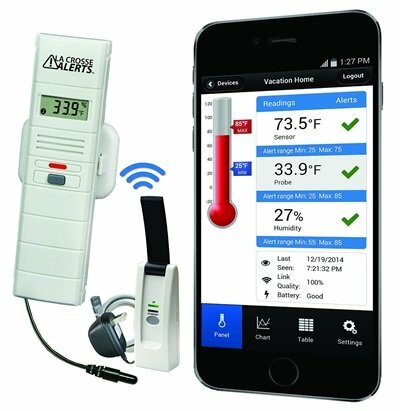 The 2 wireless thermometer sensors are easy to install. Simply clip each to a freezer shelf or suction to an inside freezer wall and you’re done. Or you can split them between the freezer and fridge. It’s also easy to place the thermometer display unit. You can chose to mount this on your freezer using its magnetic back or hang it on the kitchen wall using the spring-loaded clip that’s included. This thermometer-alarm set comes with a one-year limited warranty which effectively insures you against parts and labor that were defective at the time of manufacture. Note though, that the sensor and display each need to be powered by batteries which are not included in the box. The sensors work best with 2 AA lithium batteries although you could make do with 2 AA alkaline ones. The thermometer display will require 2 AAA alkaline batteries. The La Crosse monitor and alarm set is a good choice if you want to take your use of technology a notch higher. This is because it can remotely monitor your food 24/7 using a web browser! It’s equipped with remotely sensors that work using a web browser. So you don’t have to be at home to keep a tab on how well your food is freezing. This enables you to do errands confident that your food is keeping well-frozen. It sends alert emails and texts messages to your phone when temperature or humidity exceeds your desired range. It has a wide range of applications. So besides the freezer, it’s perfect for refrigerators, greenhouses and even sensitive electronics. It has a wide temperature range of -40 to 140 degrees Fahrenheit. So it’s suitable for freezing both foods that need to be rock frozen and those that require slightly warmer temperatures. Besides ambient and probe temperature, it measures ambient humidity so it's very useful for greenhouse owners. This system is scalable. So you can add up to 5 sensors for other areas (such as a fridge or greenhouse) provided these are within a 200 Ft range of the wireless unit. What’s in the box? Sensor, internet gateway with LAN cable & AC adapter and dry probe. Note though that this unit requires 2 AAA Alkaline batteries to operate. These are not included and will have to obtained separately. It has a wide temperature range of -22 to 158 degrees Fahrenheit. The audible and visual alarms will automatically go off when the pre-set maximum or minimum temperatures are passed. It comes with 2 sensors, which you can use in either 2 freezers, or a refrigerator and a freezer. These sensors have versatile freezer mounting options; suction cups and spring action clips, so you get to choose which of these is more convenient for you. The alarm unit comes with a fold-out stand and magnets attached on the back, making installation quick and easy. The set is portable. The remote sensor measures just 4 1/8" High x 1 3/8" Wide x 13/16" Thick while the alarm unit measures 2-5/16" High x 5-7/8" Wide x 1" Thick. So you can take it with you if need to. In any case, lithium batteries also last up to 9 times longer than the alkaline ones, so you can be sure they will last for years. You can also use alkaline batteries but remember that these will only help you register a minimum temperature of just -4 degrees Fahrenheit and they don’t last as long as the lithium batteries. The alarm unit requires 2 AA batteries to operate.